LDF won 13 seats in the by-elections to local body, while UDF and BJP settled for six and one respectively. THIRUVANANTHAPURAM: LDF regained upper hand in the by-elections to local body by winning 13 seats -- including one by an LDF-backed independent -- while the UDF settled for six seats and the BJP, one. Elections were held in 16 grama panchayat wards in Thiruvananthapuram, Kollam, Idukki, Ernakulam, Thrissur, Palakkad, Kozhikode and Kannur districts; and also in block panchayat ward each in Malappuram and Kannur and one municipality ward each in Wayanad and Kannur. While LDF clinched the Thrikkunnapuzha north and Kolacheri wards from the UDF, UDF grabbed the Kambamcode and Thainagar wards from the LDF. But UDF lost the Irupathiyettam Mile ward in Navaikulam grama panchayat, Thiruvananthapuram, to BJP's Yamuna Biju, while independent candidate Ajo Varghese won the Vellimala ward of Vandanmedu grama panchayat in Idukki. 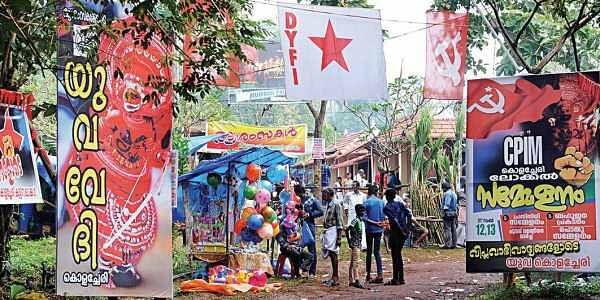 LDF: Meenmutti (Nandiyode, Thiruvananthapuram), Bharanikkavu (Sasthamkotta, Kollam), Thrikkunnapuzha North (Sooranad South, Kollam), Injikkad (Vandiperiyar, Idukki), Thrikkepadi (Pothanikode, Ernakulam), Ilankavu (Kizhakkancheri, Palakkad), Poyilpara (Ayancheri, Kozhikode), Kaitheri Panthrandam Mile (Mangattidam, Kozhikode), Kayatteel (Kannapuram, Kozhikode), Kolacheri (Edakkad block panchayat, Kannur), Mandamkolli (Sultan Batheri municipality, Wayanad), Kavumbhagam (Thalassery municipality, Kannur). UDF: Kambacode (Ummannur, Kollam), Nedungandam East (Nedungandam, Idukki), Cheenikuzhi (Mazhuvannur, Ernakulam), Thainagar (Kaipamangalam, Thrissur), Amapotta (Thiruvegapura, Palakkad), Thuvakkad (Thanur block panchayat, Malappuram).